You’ve been there before. You start a big project, and at first, everything seems to be going fine. The project roadmap is detailed and comprehensive. Your milestones are set. Team morale is high. Executive stakeholders are pleased. But soon, things start to fall apart. Deadlines are missed. Tasks are forgotten. And suddenly, your whole project is off track. Chances are, you didn’t clarify project roles and responsibilities in your roadmap. Clear roles and responsibilities are a critical success factor for any project. Without them, projects can quickly derail and stakeholders are left trying to pick up the pieces. Enter the RACI matrix. 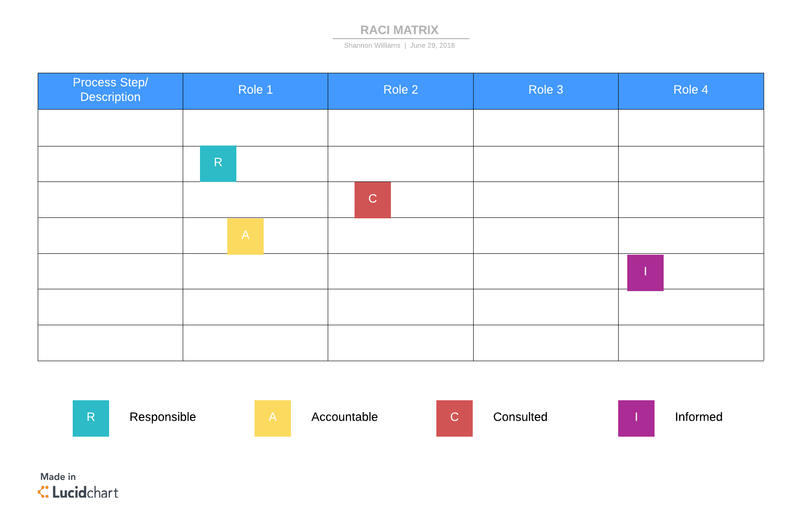 The RACI matrix helps project managers streamline their processes by ensuring each team member and stakeholder understands their specific roles. Learn why the RACI matrix is so important and how you can take advantage of it in your next big project. A RACI matrix is a chart that defines and documents ownership and responsibility at each stage of your project. Within the matrix, every task, milestone, and decision in the project is mapped out. Accountable: The person who is accountable for the successful completion of the work (i.e., the “owner” of the work). This person approves the final work completed. The responsible party is accountable to this person. This role is usually filled by the project sponsor. Consulted: The people who provide necessary input and information on the project and tasks. They are usually subject matter experts and play an active role in the process. Informed: The people or stakeholders who need to be kept in the loop with progress reports and updates. They don’t contribute directly to decisions but need to be aware of them. The value of the RACI model is that it is both quick and easy to create and also a powerful tool to maintain expectations, organize roles, and streamline processes from project start to finish. All within a straightforward, at-a-glance chart! Besides clearly designating roles, the RACI matrix encourages greater communication at every level. By giving equal weight to the “Informed” role, stakeholders who may otherwise have been excluded from the conversation are brought into the loop. While “Informed” stakeholders typically don’t provide insights or direction, they can operate more effectively in their spheres of responsibility when they know what’s going on. The RACI matrix improves project efficiency and effectiveness across the board. The beauty of a RACI matrix is that is simple to create. Follow these four steps to strategically allocate project roles and assignments. Meet with key stakeholders to identify every task, milestone, or decision within the project. The list should include both deliverables (such as products) as well as activities like meetings. List these project items in order of completion on the left-hand side of the matrix (the y-axis). Identify all the project roles—typically job titles—along the top row (the x-axis) of the matrix. For example, the x-axis might include roles such as project manager, business analyst, developer(s), technical architect, and CTO. You may discover additional tasks to add to the y-axis as you uncover all the relevant stakeholders in the project. Add those to the matrix as needed. Next, go through each cell of the matrix and fill in the appropriate RACI role (responsible, accountable, consulted, informed). Work your way down the task list until the whole model is filled out. Keep in mind that tasks may have more than one responsible stakeholder, but there should only be one accountable person per task. 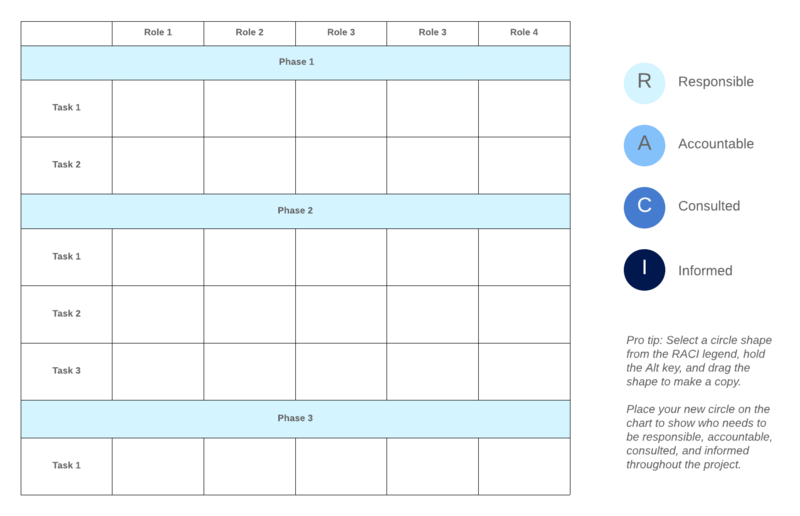 Once your RACI matrix is filled in, share the chart with all the project stakeholders and solicit feedback. Iron out any conflicts or issues with the assignments and then get final approval on the model. Be sure to approve the model before the project begins so that everyone is on the same page. For the RACI matrix to be most effective, there are a few things to consider. Second, keep in mind that occasionally there are roles that don’t fit the mold. For instance, while each task will need a responsible and accountable party, it may not be necessary to inform or consult on the work. And that’s okay! Especially in large projects with many moving parts, reducing clutter can improve efficiency and clarity. In this case, an alternative model, called RACIO may work well. RACIO includes an “Omitted” or “Out of the Loop” designation for those roles that don’t align perfectly in the RACI model. So, if a task doesn’t require every stakeholder to take an active role, you can add an “O” to the stakeholders who can ignore that task. This designation frees them up to focus on the most relevant work to their role. By strategically assigning roles within the RACI matrix, you can optimize the model for greater project efficiency. Lucidchart is a cloud-based diagramming platform that helps busy project managers create valuable charts and process flows, including RACI matrices. The real value in a RACI matrix comes through clear communication. But if your project stakeholders don’t have easy access to the RACI assignments, they’ll have a difficult time staying on task. Lucidchart unlocks that power by making it easy for managers to share their RACI diagrams with their team members at the click of a button. Because Lucidchart operates on the cloud, your resources are always available no matter where (or when) you want them. Ideally, your project will go exactly to plan. But unfortunately, that’s not always realistic. When changes need to be made, a flexible RACI chart is a must. Lucidchart gives you the flexibility you need to adjust roles and assignments without starting over. And when changes are made, users can instantly see the updates so they don’t miss a beat. Use Lucidchart to create clear RACI models with ease and never fall behind on a project again.